While the three shuttle orbiters continue to enjoy nominal processing flows, managers are continuing to evaluate the exact launch date targets for the upcoming missions. Those launch dates have slipped at a program level, with STS-133’s mission to the International Space Station (ISS) now baselined for No Earlier Than (NET) late October, slipping STS-134 to February/March, 2011, with the potential for STS-135 to launch – if added – in late June, 2011. Discovery is looking forward to an eventful period next week, as she begins receiving her Space Shuttle Main Engines (SSMEs) from Monday, while in the Vehicle Assembly Building (VAB) her External Tank (ET-137) will be mated with the awaiting twin Solid Rocket Boosters (SRBs) on Tuesday. 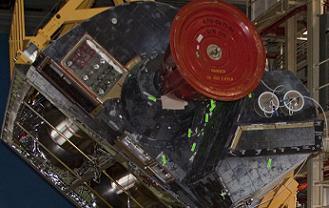 “OV-103 (STS-133) Got the LH2 tank removed from the midbody, part of the Tank Set #5. Continuing with the system testing, working the detailed testing. Got the aft ballast installed. That clears the way for the engines that are going in next week,” noted KSC Ground Operations (L2). Discovery is being processed for what is currently her final flight – pending what is only a very slight possibility of an extension, or the gaining of the notional STS-135 mission, should managers opt to remove Atlantis from converting her STS-335 flow into a baselined mission. With the addition of two EVAs, “crew loading” (training) schedules pushed the launch date out to late October, although final updates on the schedule for other visiting vehicle to the ISS – due to Dual Docked Operations (DDO) constraints – and solar beta angle cutouts, need to be worked prior to an official launch date NET announcement. The slip results in Discovery gaining several weeks of additional processing flexibility, although she is the only orbiter that is being worked on over the weekend. “OV-103 (OPF Bay 3): S-band troubleshooting (IPR-0005): Complete to date. No Dropouts were experienced. Data evaluation in work,” added the NASA Test Director (NTD) processing latest (L2). “Pre-ops for SSME installation complete. SSME installation scheduled to start Monday. Pratt & Whitney Rocketdyne/KSC: Have the STS-133 engines ready to go to support the vehicle schedule. “Drag chute installation update: The galled screws were replaced and drag chute installation was completed. 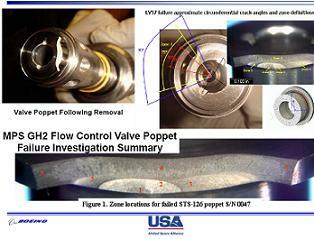 Update Interim Problem Report (IPR) 0022 update: The IPR condition – LH2 Relief Valve Functional Test, PV12 relief valve did not get expected crack pressure – was caused by a valve that was left open. The IPR is being closed as a procedural error. Work in the Hypergolic Maintenance Facility (HMF) – relating to Discovery’s faulty helium isolation valve on the Right OMS (Orbital Maneuvering System) RRCS (Right Reaction Control System) – is also on track, as the month long repair enjoyed the milestone of the replacement hardware’s arrival. As expected, the SE&I (Systems Engineering and Integration) ET/SRB Mate review for STS-133 found no constraints for the mating operations to begin on Tuesday, as engineers finalize their preparations by completing TPS foam repairs – caused by the intertank plug/pull tests – on the tank. “SRB BI-144 / RSRM 112 (VAB HB-3): Left Forward joint closeout complete less PR (Problem Report) on a de-bond. Right Heater cable: Damaged sensor wire. Awaiting hardware (solder kit) delivery. Parts coming from Utah no earlier than June 15. Not an ET mate constraint,” outlined NTD processing information. “No constraints for ET mate scheduled for June 15. Endeavour’s flow inside OPF-2 is also on track, even if managers decide to advance the flight ahead of STS-133 in the mission order, as has been intimated as a possibility via the ongoing evaluations. Work is also taking place on installing a Boundary Layer Transition (BLT) Detailed Test Objective (DTO), which involves a small bump being added to one of the tiles on the orbiter’s belly. The goal of the experiment is to measure the effects of increased heating from an early boundary layer transition as the orbiter returns to Earth. Discovery has been the only orbiter to fly with the BLT DTO, opening with STS-119, prior to the Program Requirements Control Board (PRCB) approval to add a protuberance to one of Endeavour’s tiles. “Got approval to do the BLT on OV-105 (Endeavour) similar to what was done on OV-103 (Discovery). 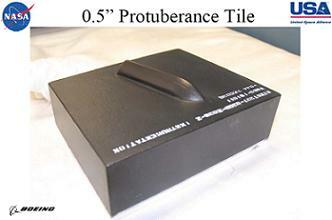 There was discussion regarding protuberance height. The team brought forward rationale for 0.5 inch height, which will go forward to the Program for approval,” noted the Standup report, with a full article based on the resulting PRCB presentation to follow. Meanwhile, with the Mobile Launch Platform (MLP) – used during STS-132’s launch – now back inside the VAB, preparations for booster stacking are picking up inside the Rotation Processing and Surge Facility (RPSF). “SRB BI-145 / RSRM 113 (RPSF): Left Aft Booster Buildup: Acrymax application to RT-455 complete. 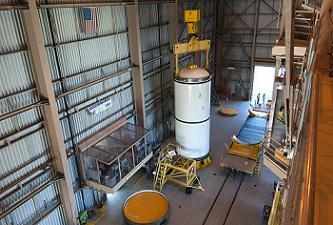 Preps to transfer of AFT Booster to pallet in work. Right Aft Booster Buildup: Aft skirt transition floor plate RTV complete,” noted processing information. With stacking set to take place after managerial approval, Endeavour’s ET-138 – the final ET to be constructed at the Michoud Assembly Facility (MAF) – is set to arrive at the Kennedy Space Center (KSC) next month. Engineers in New Orleans are tracking a June 20 completion date, followed by a rollout ceremony on July 8. “ET-138: In Building 420, the TPS closeouts are going well. Testing is going well. Shakedowns continue. Are off the top of most of the hydrogen tank, and have started the process of pulling the scaffolding out of the intertank,” noted contractor Lockheed Martin on the Standup report. Atlantis is still at least a few weeks away from knowing if she’ll get to fly on a baselined mission, with her current processing flow in OPF-1 continuing on the pre-planned STS-335 LON (Launch On Need) rescue support for the final scheduled flight of the shuttle. “RCC (Reinforced Carbon Carbon) thermography inspections are on-going. Orbiter window inspections continue with completion expected Monday. Windows 9 and 10 will be inspected next week. FRCS (Forward Reaction Control System) functional and checkout is complete. OMS pod functional checkout continues into next week,” noted NTD processing information, which also noted the addition of a ninth IPR to her flow. Following Atlantis’ highly successful STS-132 mission, her flight crew are being debriefed by managers, as the IFA (In Flight Anomaly) review closes in on being presented to the PRCB next Thursday. As part of the post-mission flow, the orbiter’s Flow Control Valves (FCVs) have been removed and shipped back to their fabricator Vacco in California. There they will be inspected for any signs of cracks, relating to the mitigation of liberations from the poppet area of the valve, as seen during STS-126, leading to a year long investigation into the incident. STS-335 was assigned ET-122, a tank that is undergoing repairs after suffering damage during Hurricane Katrina. Processing of the tank has been proceeding to plan, although a reference to the evaluations on the final manifest running order was noted on the latest ET-122 flow report. 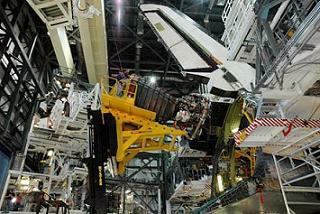 Shuttle managers are hoping for a decision on STS-135 by the end of this month.